In addition to her role as CFO, Ms. Straub is responsible for a multitude of functions, including HR, IT, governance, compliance and shared services for Bosch in the U.S., Mexico and Canada. She has shaped Bosch’s North American strategy for diversity and inclusion, corporate social responsibility and innovation. Ms. Straub is passionate about technology and innovation, guides internal startups through the Bosch Startup Platform, and regularly mentors external start-ups through Bosch’s partnerships with 1871 and TechStars. Ms. Straub joined Bosch in 1993 as part of the Bosch Chassis Systems trainee program in Blaichach, Germany. She has extensive automotive and leadership responsibility in the areas of accounting, controlling, manufacturing, and mergers & acquisition in Germany, France and the U.S. 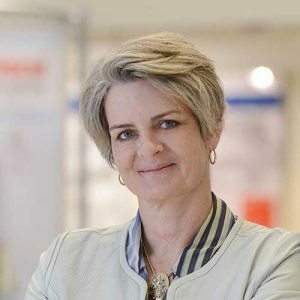 In 2006 she was named president of Bosch’s Chassis Systems Full Brakes division in North America, a position she held until her most recent appointment in 2010. Ms. Straub currently serves as the chair of the Board of Directors of Inforum, a professional organization focused on creating strategic connections to help advance professional women in Michigan and the Midwest. In 2010 and 2015, Ms. Straub was recognized by Automotive News as one of the ‘Top 100 Women in the Auto Industry.’ She is a guest lecturer for the University of Michigan Ross School of Business program, “Ascending to the C-Suite: From Theory to Practice.” Ms. Straub serves on the Board of Directors for MTS Systems Corporation (Nasdaq: MTSC) and Horizon Global Corporation (NYSE: HZN). Ms. Straub’s educational degrees include Industriekauffrau IHK and an advanced business administration degree with thesis, Diplom-Kaufmann, from the University of Munich.